The first mouse that became popular like a pet was the Golden Hamster. It lives in the desert. First it became a pet in England in 1931. It is a tame animal, clean and easy to take care of it. It�s body touches the floor. It�s tail is very short, his eyes are very big and when he gets old its fur falls down. Although his eyes are big, it cannot see very well. Therefore it uses its whiskers. It has golden fur with black and grey patches on it. This animal originated from Asia Minor. 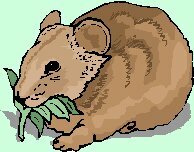 This is a desert mouse, therefore he lives in a very hot climate. It bears a climate of 32�C. It does not rain a lot in the desert and so the hamster drinks dew. It digs holes under the ground to protect him from the sun, and uses them as a house. 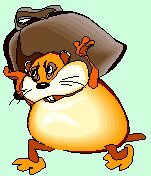 The hamster is like a camel; it has 2 bags on its cheeks to store food. You have to clean the hamster�s cage once a week. You have to change its food and water everyday, and wipe the cage if he drops water. If you do not clean his cage it will smell bad. The hamster likes oats very much. He also likes wheat, brown bread, nuts, fruits and vegetables. In the evening you have to give him a spoon of cereal with fresh milk, and sometimes a dog biscuit. Chocolate is poisonous for a hamster.